This Murdex atomizer is an innovative RTA tank with SS316L Coil which features 2-post dual terminal build deck, single and dual coil control ring and adjustable bottom airflow. Moreover, you can extend the tank to 5ml capacity. SS316L version. 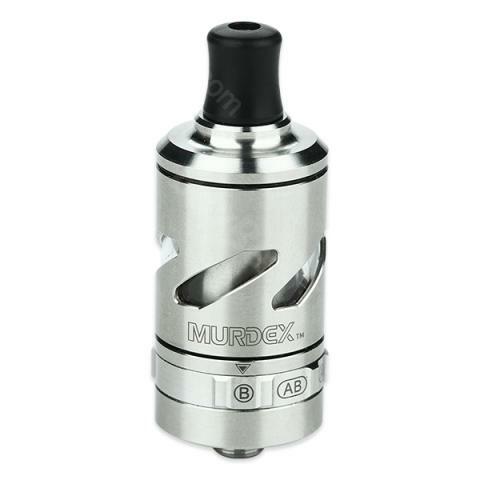 Murdex SS316L Coil Control RTA is a coil control tank which supports three different coil systems - single coil-A, dual coils-AB and single coil-B. Users can adjust the coil system by revolving the coil control ring. Together with e-liquid reflux resistant system (ERRS) drip tip, extendable 5ml capacity and bottom adjustable airflow, Murdex RTA provides a remarkable vaping experience to you. SS316L version. Eine Gute Kaufentscheidung, ich kann Murdex SS316L mit gutem Gefühl weiter empfehlen. Murdex SS316L Coil Control RTA Tank Atomizer - 2ml meets the needs of smokers for nicotine, no leaks no mess no wicking and stuff. very good price also.